A few months back I attended an AIGA (design) event in which Medtronic, a local medical device corporation, had their internal marketing team present their recent rebrand and website redesign. This was a huge step for their organization as their brand had been consistent for 50+ years. The primary theme of their presentation was how they 'socialized' the project internally to prepare everyone for the big change and get everyone on board. This resulted in a very successful brand and website launch. The presentation got me thinking about how to assist our own clients in managing multiple stakeholders during our website redesign projects. This is a question we often get prior to and during projects as every organization has their own unique internal challenges. The ideas presented below are a combination of those suggested by the Medtronic team and our own from 20 years of experience here at ArcStone. Before a project begins, there is a lot of research that needs to be conducted; this is not only to determine the scope of your redesign but it's also necessary to research vendors. Below are a few things you can do before a project starts to help ensure success. Who will be involved in choosing a vendor? Who needs to be aware of the project status but does not need to be a part of the smaller decisions? Who will be involved in the day-to-day project? Who will be the final decision maker and is responsible for project success? Once you have answered some of these questions and determined a core project team, be sure to explain the team structure to the rest of the organization as well. If they know at the beginning that they are not expected to be heavily involved, there is less of a chance they will jump in unnecessarily throughout the project. Project management is the #1 key to a successful website redesign – not only to keep you within timeline and budget, but also for compatibility between the project team and stakeholders. The project manager needs experience navigating the inevitable challenges that will arise. Call a few client references and ask what the day-to-day activity is like for a project, how any setbacks were dealt with and how the project manager managed multiple stakeholders. Choosing a great project manager might seem like an obvious advantage, but they are not always vetted thoroughly as you get distracted by other decisions. If expectations are clear and you gather input from staff right from the beginning, it will greatly improve your momentum and keep internal stakeholders happy. *If you are a nonprofit, don't forget about your board members and primary donors. Although they aren't employees, it is just as important that their input is gathered. Ideally the final decision maker is your marketing director or leader of the project – not the president or CEO of your organization. Although the president's insight is certainly valuable, having someone closer to the everyday work and conversations usually yields better results. However, there are key phases where a president/CEO's input may be needed such as the kick-off meeting and design approval. These are key steps to gather feedback because as you move past the design phase, any sweeping changes can be very expensive, so best to get their buy-in early. *If you have multiple program offerings or departments that operate independently, you may need to assign one final decision maker for each that will provide the final sign-off on their section of the website. This is often the case for large nonprofits or corporations. Throughout the actual redesign, it can be helpful to bring the organization along for the ride rather than operating behind closed doors. Here are a few tips to keep everyone aware, but not directly involved. Rather than including all stakeholders or staff members in each key approval meeting, consider sending out status updates or memos on the project status. Let them know where you are in the process, when you might need help or key questions you'd like input on. By keeping everyone aware of what stage the project is in, you will avoid frequent questioning from stakeholders and will also keep up the enthusiasm from the rest of the organization. Getting bombarded with input and ideas from multiple stakeholders can be very overwhelming and distracting. This can lead to a finished website that is too focused on serving the internal stakeholders rather than the end users – which should be your #1 most important audience. When facing tough decisions or multiple options, ask "is this what our customer / donor / client would want?" Rather than presenting the new wireframes or designs internally, be sure to have your web design vendor present directly to any stakeholders. It is often better to hear advice or ideas directly from the expert instead of having them communicated secondhand by the staff. When ArcStone presents wireframes or designs, we have industry best practices and experience to fall back on for explaining the decisions our team made. Everyone has opinions, especially when it comes to logo or web design, but that's why you hire experts. Once the new website is ready to launch, be sure to present the final site to all stakeholders and staff. Explain in detail your plans for leveraging the new platform and any phase 2 projects or functionality that might come down the road. Show any key team members how to make updates and contribute blog posts so they are prepared to get involved. Also, small bugs or broken links are inevitable when launching a brand new site, so let your colleagues know how to report issues as they find them. This will avoid complaints and give them more control over the situation. Hope you found these tips helpful! 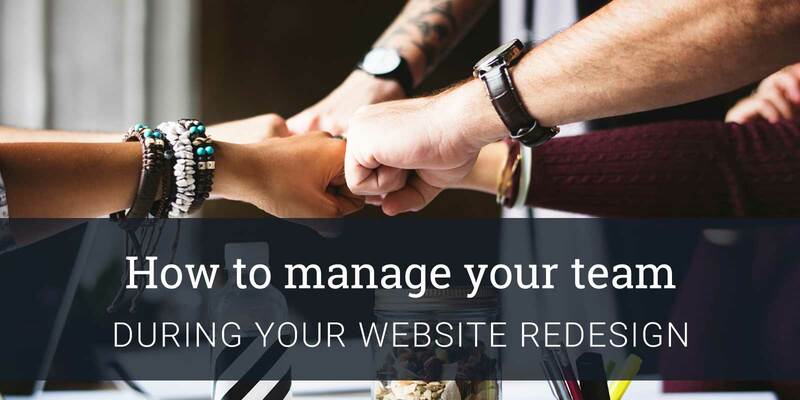 A website redesign is an exciting time for any organization, but to stay within scope and timeline you need to manage your organization with a well-planned process. Thinking about a website redesign? Download our 10-step redesign checklist, attend our upcoming website redesign event or check out our 25+ website redesign resources.